Ricky van Broekhoven (1984) is a designer and musician from Eindhoven the Netherlands. He started his education at the department of spatial design at the St. Joost academy Breda. Simultaneously he was producer and performer of the electronics live-act Axxonlab. Experiencing music as something tangible, like a material that can be formed and manipulated, soon the topics of sound and space became merged. He got fascinated with the phenomenon of visible sound vibration called cymatics. He was invited to continue his study at the Rietveld Adacemy in Amsterdam where he explored and elaborated on the emergence of sound as a perceptible energy. After graduating his MA in 2012 he founded Studio van Broekhoven, where he researches natural forces and processes of noise. He calls his field of work spatial sound design. 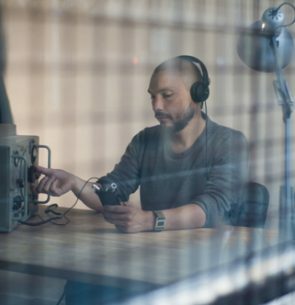 In his laboratory workshop that simultaneously functions as a sound studio he engineers instruments and prototype tools that help creating unique objects and immersive environments. His projects are ranging from collaborations with health care institutions, to internationally renowned academies and museums. Van Broekhoven currently lives and works in Eindhoven. 2012 Paris, La Gaite Lyrique / AAARGH!